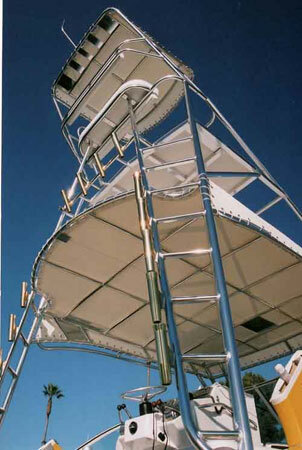 Pacific Yacht Towers is a family owned company specializing in the design and fabrication of Marine Boat Towers. Pacific Yacht Towers also makes other marine accessories such as Boat Leaning Posts, Rod Holders and Railings. We make boat towers and parts for marine manufacturers, boat dealers and the public. We have been located in the same building in San Marcos, California. Which is in San Diego County for over 20 years. Our staff is made up of true metal craftsman who specialize in building boat towers that are both strong and beautiful. We take great pride in our work and it shows in the final product. All of our products are custom made to suit your needs and your boat. If it can be made out of metal, we can handle the job. Please take a look around the website to see just a few examples of our work. If you have any questions or would like to schedule an appointment, feel free to contact us at (760)744-4831. We would love to discuss your custom project with you.